BNF Publications are always looking for ways to improve. Currently, we are particularly keen to understand what users think about the palliative care content within our publications. With that in mind, below is a link to a short survey (approximately 10 minutes) that aims to help us understand how BNF Publications can further support palliative care practice. We thank you in advance for your participation. BNF Publications are pleased to announce the appointments of a Chair and Deputy Chair of the BNF for Children’s Paediatric Formulary Committee (PFC). Dr David Tuthill has been appointed as the Chair of the BNF for Children’s PFC. David is a consultant general paediatrician at the Children’s Hospital for Wales and Llandough Hospital. His main clinical focus is children with allergic and general paediatric problems. He has been involved in work around medication and patient safety and also has expertise in quality improvement. He has been a member of the PFC since 2011. David is also a member of the Medicines Committee at the Royal College of Paedatrics and Child Health (RCPCH). He has been actively involved in development of the Medicines for Children website, a joint initiative between RCPCH, the Neonatal and Paediatric Pharmacists Group (NPPG) and Wellchild. Neil Caldwell has been appointed as the Deputy Chair of the BNF for Children’s PFC. Neil is a consultant pharmacist for children’s services at Wirral University Teaching Hospital and honorary lecturer at Liverpool John Moores University and has been a member of the PFC since 2011. Neil is a lead reviewer of Medicines for Children leaflets and, since 2009, he has been member of the NPPG committee; he was also part of the NICE Guideline Development Group for Antibiotics for Early Onset Neonatal Infection from 2010­–2012. Neil was awarded a Faculty Fellow of Royal Pharmaceutical Society in 2014. Since launching the new BNF structure, we have had a number of queries about how the prices in current BNF Publications align with the prices in BNF legacy products. For branded preparations, prices are derived from the NHS Dictionary of Medicines and Devices (DM+D). This policy has not changed in the move to the new BNF structure. 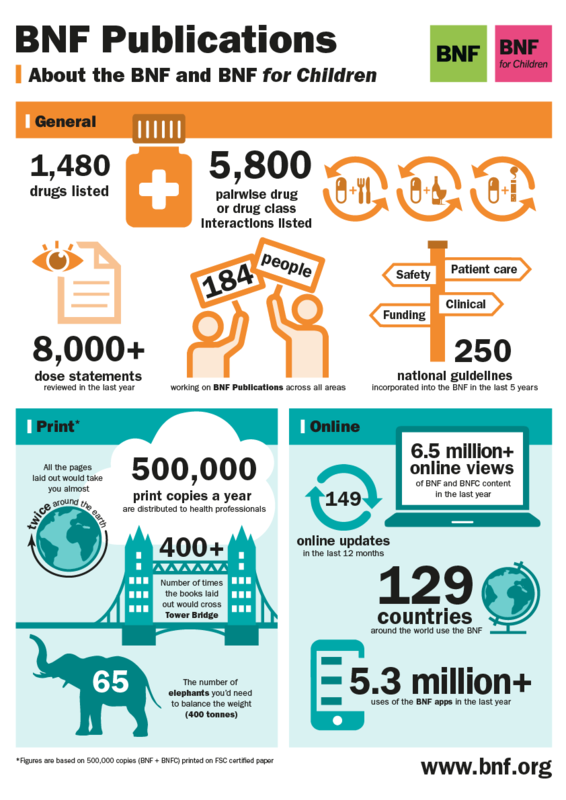 Due to space constraints in print publications, we are not able to list all available generic preparations cited in the NHS Dictionary of Medicines and Devices (DM+D). Instead, we have editorial processes that allow us to create a preparation entry that is representative of all generic preparations, including a representative price. This price is based on the NHS indicative price for all related generics in DM+D. This policy has not changed in the move from the legacy BNF structure. For branded preparations, the situation is the same described under Print, above. In digital versions of the new BNF Publications there are no space constraints and so for generic preparations, prices for all available preparations are included. This has changed in the move to the new BNF structure – in the past, only a representative generic preparation was listed, as described under Print, above. BNF Publications based on the new structure also list the Drug Tariff price, where available. This is an enhancement added to the new structure based on user feedback and is not included in BNF legacy products. The new BNF Publications have been built to allow a more seamless updating of the price information and the price can more rapidly be updated than was possible with the legacy system, which required a laborious manual process. Legacy versions are due for retirement and therefore there is minimal support for non-clinical content i.e. product information such as prices. We advise that the new BNF Publications should be used in preference to the legacy BNF Publications, but this is particularly true when considering price, where the content will be more up-to-date. The February 2017 eNewsletter contains the latest guidance and content updates to the BNF and BNFC. This month includes 3 new monographs that have been added to the BNF. Have you ever wondered what processes go into the making of the BNF? Follow the journey of a single piece of content on its way to publication with our infographic. The September 2016 issue of the BNF eNewsletter contains the latest guidance and content updates to the BNF and BNFC. This month also sees the publication of the new BNF 72 and the BNF for Children 2016-2017. There’s more to the BNF than you may think. 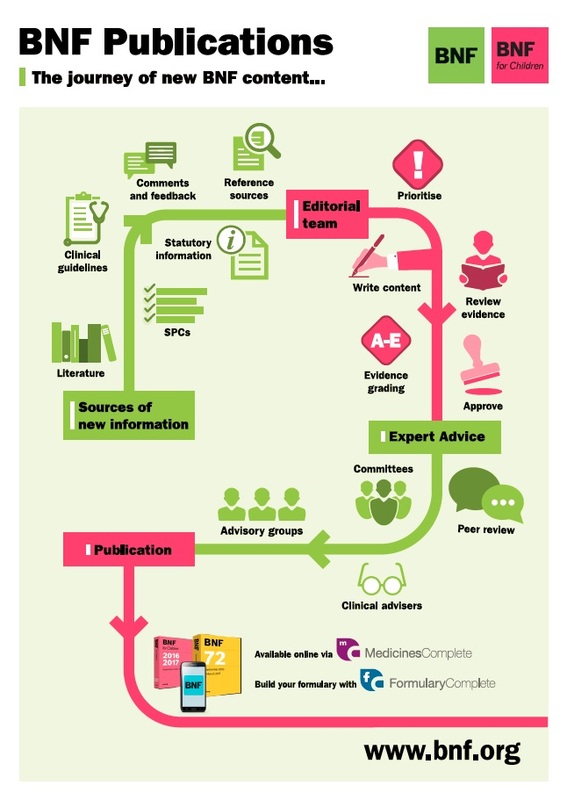 Our BNF infographic shows the content and reach of the BNF.